Latin word tattoos not only look awesome, they have a romantic sound, which makes them a very popular choice for a tattoo word phrase. These tattoos are also versatile, which means they can fit just about anywhere on the body depending on the phrase that you choose. Latin is an extinct language, but was once the universal language thousands of years ago. Although a number of people are very familiar with Latin phrases and words, the use of the spoken language is typically limited to religion along with medical and legal arenas. For example, you've probably heard the Latin phrase, "habeas corpus," which means the right to petition the court. However, another area that you can really find the use of Latin is tattoos. 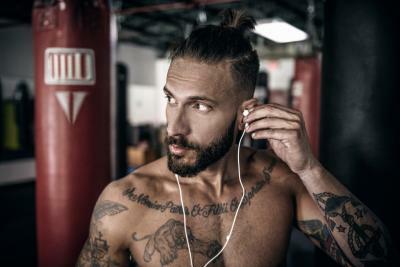 Not only has there been a surge in popularity because of celebrities inking their favorite sayings, but this lost language allows you to add a unique spin to your tattoo or idea. While you can turn any saying or motto into Latin with a simple translator, there are several phrases that you'll see frequently tattooed in Latin. Latin tattoos can come in a variety of styles and are popular for both men and women. While you'll commonly see Latin phrases in a handwritten or calligraphy writing style, these look great in Old English and block text styles too. Because these word tattoos typically have a deeper meaning to the patron, they may also choose to write the phrase in their own handwriting. Additionally, while most word tattoos are typically in black, don't be afraid to give your tattoo a little color through flourishes or just writing the words themselves in a colored ink. 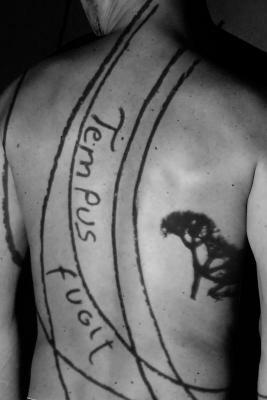 Depending on the size of the quote the placement of a Latin word tattoo is very open to your own personal preference. 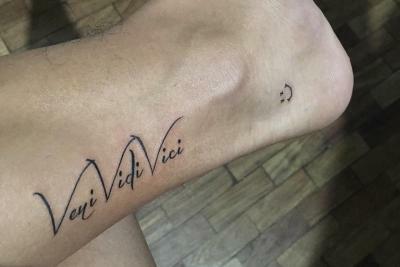 For example, with shorter quotes like "Veni Vidi Vici" (I came, I saw, I conquered), you could have them inked on the insides of your wrist or along the bone of your ankle. The ankle is also a great place for this particular tattoo because your feet typically lead you to conquering the world. Smaller phrases also fit snuggly along the shoulder blade and following the line of the collar bone. 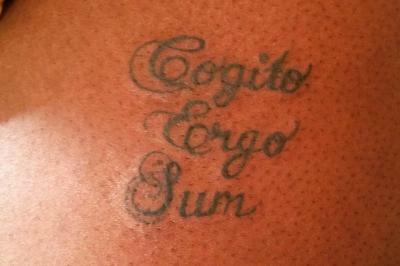 Stacking the words like ''Cogito ergo sum" (I think therefore I am) works great on the calf or bicep. If you choose a matching phrase like "vita" and "mors," you could choose opposing areas like the knuckles of both hands, calves, collar bones or both shoulder blades. 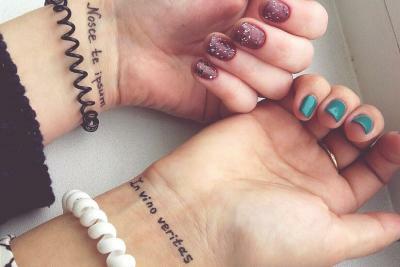 This opposing placement, like on opposite wrists, can also be fun for additional phrases like "Nosce te ipsum" (know thyself) and "In vino veritas" (There is truth in wine). Given the luck you are having that day, looking at either phrase may apply. Phrases that are a bit more wordy like "Quod me non necat me certe confirmat" (That which does not kill me makes me stronger) may require a bit more space. These longer phrases or mottos work better along the top of the shoulders, front of the chest, lower abdomen, down the sides of the arms or legs, along the ribs and along the lower back. This gives these larger quotes more room for detail and space, making them more readable. Depending on the fine line skill of you artist, you could work longer quotes into smaller spaces, but the type style that you use should be more simplistic or it could lose readability. Additionally, the placement of the tattoo can be based on the meaning. For example, "In nomine Patris et Filii et Spiritus Sancti" (In the name of the Father, the Son, and the Holy Spirit) may be placed across the chest or around the neck similar to a cross because of the meaning the tattoo holds. 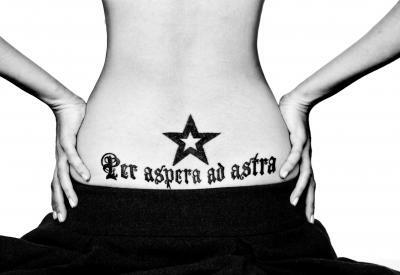 Adding additional elements to the design like a star with the phrase "Per aspera ad astra" (To the stars through hardship) can require more room and fit nicely on the lower back. Angelina Jolie: The actress has a lower abdomen Latin tattoo that reads: "Quod me nutrit me destruit." (Translation in chart above). David Beckman: The football player has a tattoo on his lower left arm referring to his wife: "Ut Amem Et Foveam." English translation, "So that I love and cherish." Danielle Lloyd: The model and actress has a Latin tattoo on her left shoulder that is grammatically incorrect according to experts. The Latin tattoo is, "Quis attero mihi tantum planto mihi validus." Her intended meaning was, "To diminish me will only make me stronger," however, what she has inked in Latin really means, "As who am I wearing myself away for myself." Among his others, Colin Farrell has a popular tattoo on his left forearm that reads "Carpe Deim." 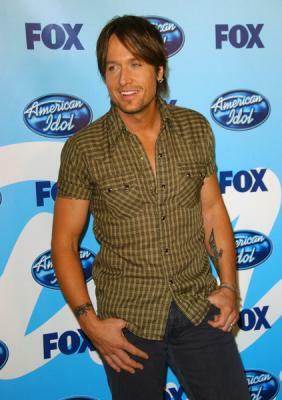 Keith Urban: The country singer has "Omnia Vincit Amor," or in English, "Love Conquers All," on his right wrist. Before getting your Latin word tattoo, make sure you have the correct spelling and words for your tattoo. It would not be cool to have a permanent tattoo that is incorrect. Native Latin speakers are no longer in existence, but there are plenty of Latin scholars, experts and resources on the Latin language. 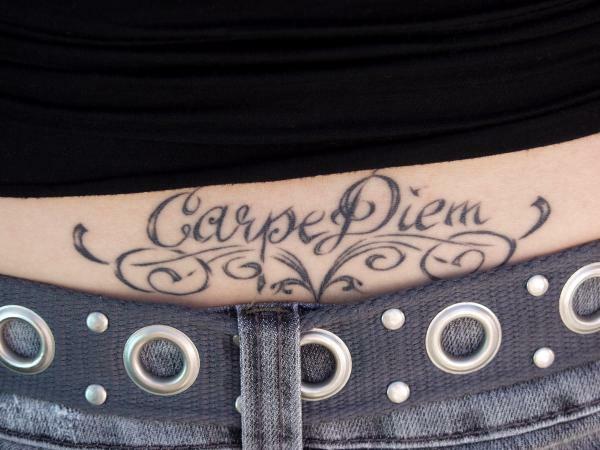 Double check your Latin phrase before it is permanently etched onto your body. If you are thinking of getting a word tattoo but would like to add a little mystery, Latin is the way to go. Not only do these tattoos have a unique, romantic feel and can fit just about anywhere, but they just look interesting when they are etched on the skin. So whether you want to remind yourself to 'seize the day' or 'time is fleeting', make sure to double check your spelling with an expert then make an appointment with your favorite artist.